Star jasmine (Trachelospermum jasminoides) is a fragrant, evergreen climbing vine that thrives in mild climates. This fast-growing vine, also called confederate jasmine, can reach heights of 40 feet if supported on a trellis, tree or other structure. The small, white star-shaped flowers bloom in the spring and have a pleasing scent. Star jasmine can survive a vigorous pruning -- home gardeners often prune the vine into a shrub shape rather than letting it climb. Star jasmine grows best in USDA growing zones 8 through 10. Cold weather can quickly kill the vine, so home gardeners who appreciate the plant's beauty and fragrance but live in cooler climates can plant star jasmine in a container. Whether in the ground or in a pot, the soil should be rich in organic matter and well-draining. Clay soil, for example, holds water and is not good for this plant. Instead, choose loose, loamy soil (amend your garden soil with leaf mold for best results) or use a potting soil that has a large amount of peat moss and sand. Star jasmine needs bright sunlight to bloom, but direct, hot sunlight will scorch the leaves. For this reason, exposure to morning sun and dappled afternoon shade works best. Indoors, potted star jasmine plants thrive in curtain-filtered sunlight during hot periods, and a minimum of four hours of direct sunlight in the winter. Evening temperatures should be between 50 and 55 degrees Fahrenheit (indoor plants may need to be moved to a garage) while daytime temperatures in the low 70s Fahrenheit are perfect for this vine. Star jasmine is drought-resistant, but like most vines, it grows best if the soil is kept moist and cool during the hot growing season. Star jasmine should receive regular waterings if you want the vine to thrive. Keep the soil moist, but not soggy. Slow, drip-watering is best. In the winter, when the vine goes dormant, reduce the amount of water and let the soil dry out a bit. Star jasmine plants are climbers. If they do not have support, they will creep along the ground or trail out of containers. To maintain the plant in a neat, bushy shape, pinch off the tips of new growth, which will encourage the plant to leaf out more. After the flowers fade, prune them away. This will also help contain the plant. Star jasmine plants do not necessarily need fertilizing. If you see the leaves of the vine turning yellow, however, this could be a sign that the plant is lacking in nutrients. This usually happens on new growth in the spring. 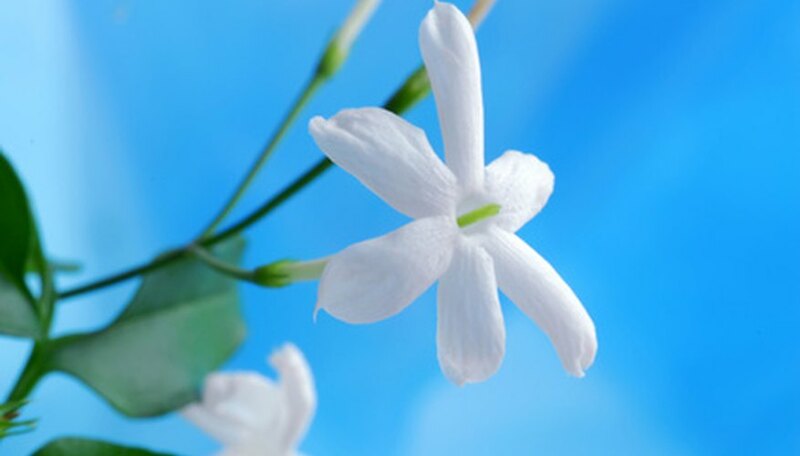 Give the jasmine a feeding of a fertilizer formulated for blooming climbing plants according to the direction on the label. One application in the spring should be sufficient.